We have acquired some of the best turkey hunting grounds in Eastern Ontario all within a 1 hour drive of Ottawa, Ontario. Turkey numbers are on the rebound after a few tough winters and we have the properties to find them! 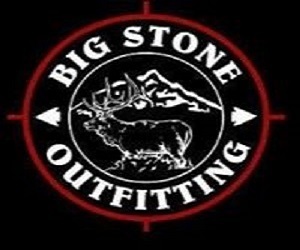 Our hunts are fully guided where all you need to provide is your own clothing, hunting permit, firearm and ammunition. 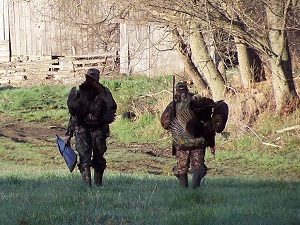 Hunts begin before daylight and end at 2pm. Accommodations and breakfast can be provided if booking one of our “full fan” packages or for the local hunter looking for a good spot and close enough to stay at home we offer a discounted daily package also. 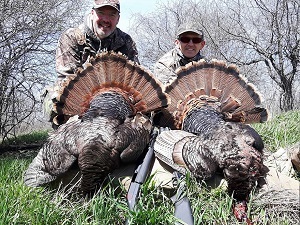 If new to turkey hunting or if you just don’t have the time or properties to scout, we can put the odds of success in your favor! Most years we average over a 95% success rate and offer a $50 “no gobble, no see” guarantee. If you or your guide don’t see a turkey or hear a gobble, you get $50 credited to a future turkey hunt with us. Last Minute Special: $350 p.p./day incl. One night accommodation and breakfast. Min. 2 days. 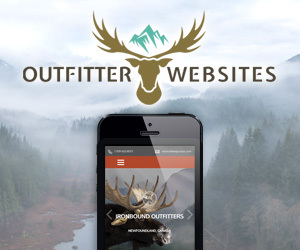 As about rates for local hunters who do not require Accommodations or Breakfast. 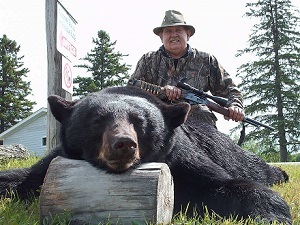 Come enjoy incredible bear hunting while staying in 4 star waterfront accommodations only 1.5 hours north of Ottawa or 3 hrs. from the Canadian/American border. Our Bear hunts are fully guided where we take you to and from your stand daily, bait, track and skin your bear and freeze your hide. 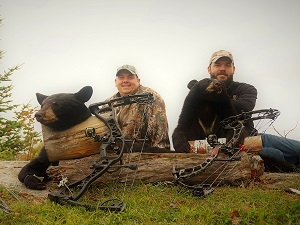 In the past 7 years we have averaged close to a 95% viewing rate and 85% shooting opportunity rate for Bears. The average sized bear in our territory is consistent with the rest of Eastern Canada being 180-200 lb bears in the spring and 250-300 lb bears in the fall. We have had two monsters at 350 lb’s harvested during recent spring seasons with several others above 250 lb’s being taken. 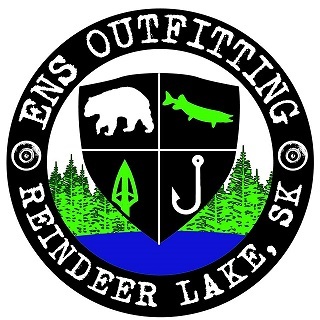 Our Bear hunts include a boat, motor and the first tank of gas for fishing as many clients enjoy trying their luck for northern pike or lake trout in the mornings prior to heading to the bear stands. 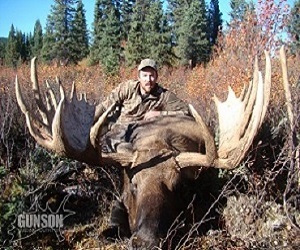 Some hunters also bring their ATV’s to travel the many logging roads and ATV trails. The mornings and days after harvesting your bear are yours to enjoy as you like. Last Minute Special: $1600 includes bear and fishing licenses.